It has been described on the CH page how this unusual two-seater aircraft was used in the calibration process of the CH radar system. It was chosen for its ability to fly in tight circles i.e. the nearest thing to hovering in those days and indeed if it was flown into a strong wind its forward progress was virtually zero. Senor Juan de la Cierva had 'invented' this machine in Spain in the late nineteen twenties, but it was still in development when he was killed in a civil aviation accident at Croydon airport. But at the time of the outbreak of the war it was an established Avro built machine for certain special applications, and indeed there were several private owners in this country. There were two versions. The C30 which had short fixed wings required a 30 yard take-off and landing run had a loaded weight of 1400lbs., flew at 100mph and had a range of 280 miles. The C40 was a 'direct take-off' model which could make a ten foot hop into the air without any forward run, this being achieved by a temporary 'clutching in' of a drive to the rotor from the main engine. It could also land without any run and had a speed of 120mph. The C40 also had articulated rotor blades which were free to rise and fall as the rotor turned. Avro manufactured these aircraft from 1934. Some were bought by the Air Ministry and they formed 1448 Flight at Duxford. 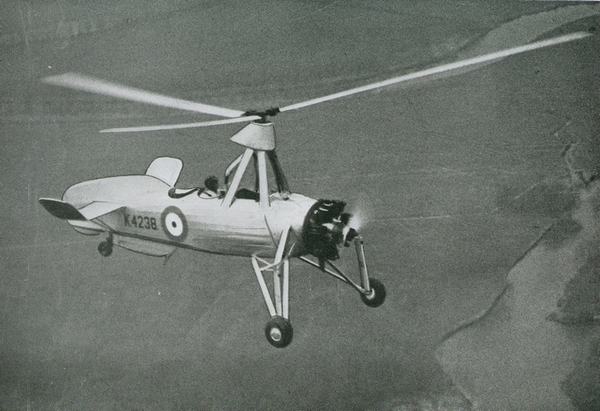 The Air Ministry originally called the aircraft a 'Gyroplane' but by 1941 the official name had been changed to 'Rotaplane'. 1448 Flight became 529 Squadron in 1943 and operated first from Halton and then Henley on Thames. This squadron was exclusively used for radar calibration work. The following picture is from the author's copy of "The Royal Airforce in Pictures" by Major Oliver Stewart published in 1941 by Country Life Ltd.
Thankfully a small number of these aircraft still exist, K4232 shown on the left being on display at the RAF Hendon Museum, a beautiful complete example, and another bearing the civilian registration G-ACUU is at the Imperial War Museum Duxford. 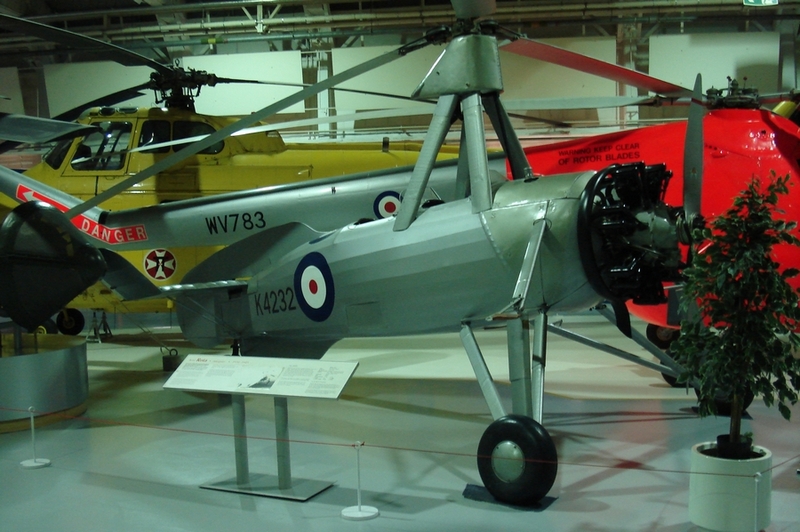 The de Havilland company built some of these machines in around 1930 and their museum at Salisbury Hall near St.Albans was exhibiting C-24 G-ABLM in 1980. Another picture is available at Fantasy of Flight site whose museum in Florida has K4235 on display. This Start Flying site provides a full history of the machine.